Funerals are often sad, however they can also be heartwarming in that they bring back fond memories of happy times. Perhaps Sofia and Madeline were smiling and laughing about some happy memory mentioned in the Service, or they might have been trying to cheer themselves up by talking about their children. Memories? Sofia didnt really know the lady and Madeleine lives abroad for a long time. 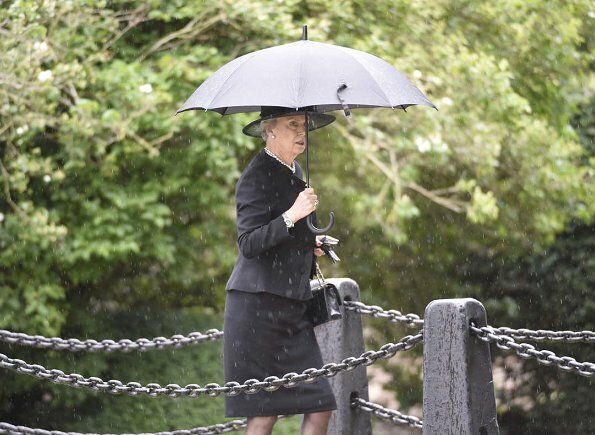 Only the queen and maybe victoria knows the lady closely. 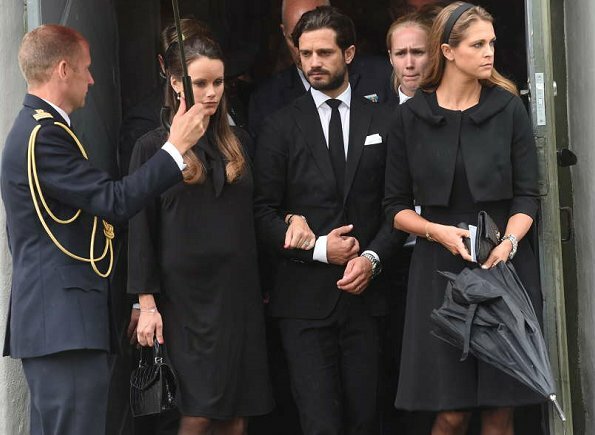 Sofia was also caught giggling when she was going to the memorial of thrle terroristas attack. Memories? I think there is a lot of Cambridge Excuses for both of them behavior. Agreed, it's so very rude and disrespect of them to be laughing at a funeral. I'm not that surprised that Sofia is, but Madeleine? I expect better from her. So rude of them. 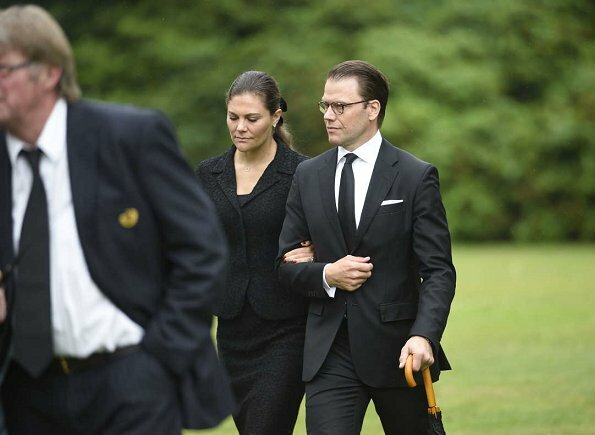 @MooseAC: How do you know they were laughing at the funeral, i.e. in church and cemetary? Sorry but I find it much more rude to make nasty assumptions about situations and people while not knowing what happened! As you can see these pictures of them smiling were taken when they were exiting some building and they discovered they have some trouble walking on their heels because the footpath was wet and slippery from the rain falling (all ladies had some struggle walking with their shoes). Situation that can make people smile and react automatically. For me it looks perfectly innocent situation that lasted only moments and can happen even at the funerals. 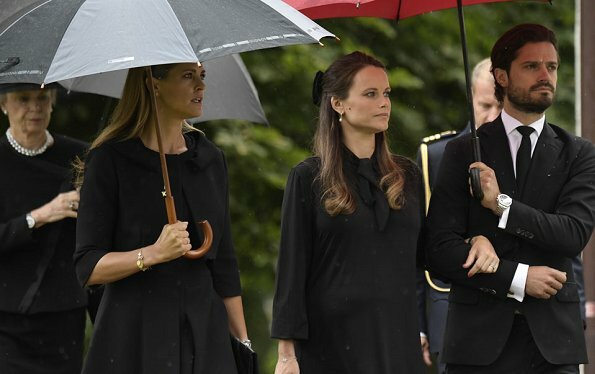 There were pictures of CPss Victoria and Queen Silvia with smile on their lips as well, so why do you bash only the princesses of this little episode? I'm sorry but I disagree. Trouble with heels? They walk on heels everyday. Plus if you are really sad/grieving about the death of someone, you will not think trouble walking on heels it's funny! I'm just back from a little vacation and oh, jeez...looks like nothing has changed here...I just don't understand why do you want to see everything so black and white, and rip people to pieces when they dare to smile a little? I watched video Karl posted link here, and it was clear that Madeleine and Sofia commented on something and then they smiled politely. It lasted only seconds but its obviously disrespectful in some people's opinion. We saw group of people attending a funeral of a woman who got to live to great age. They showed their respect and think of her but that doesn't mean that life has to stop from now on. Or do you think they have to stop smiling and only dress in black for the rest of the year? No. I no dot expect tgey wear black for the resto of the year and they stop smiling for life. 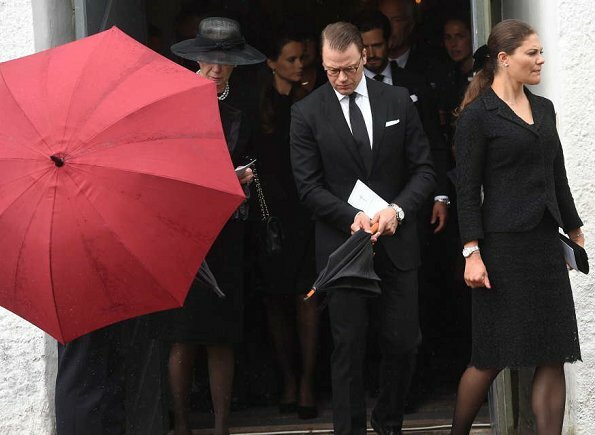 I just expect people to be serious (and obviously sad and grieving) during something as serious and sad as a funeral. I dont think its too much to ask. 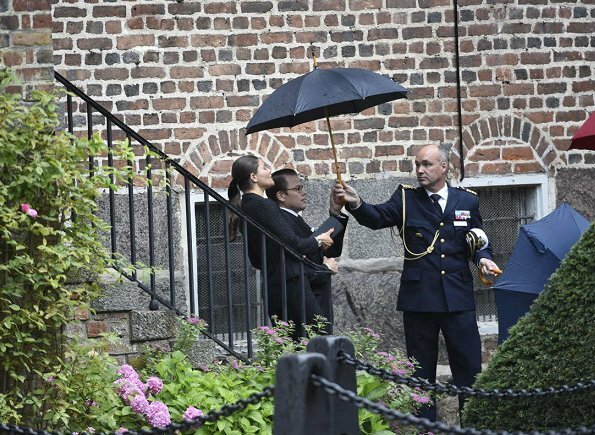 Sofia was caught in video by the media laughing in the memorial event. My owm family had a few funerals (unfortunatly) but you wouldnt see this. It was a bit disrespectful for some. Thats all. Lets not make of this that big of a problem. Raquel Alves, I recently lost my aunt. What I remember from the funeral was deep saddness. You can imagine my surprise when we were later looking with our cousins at the photos taken during the funeral day...and there were pictures that had captured us with a smile. 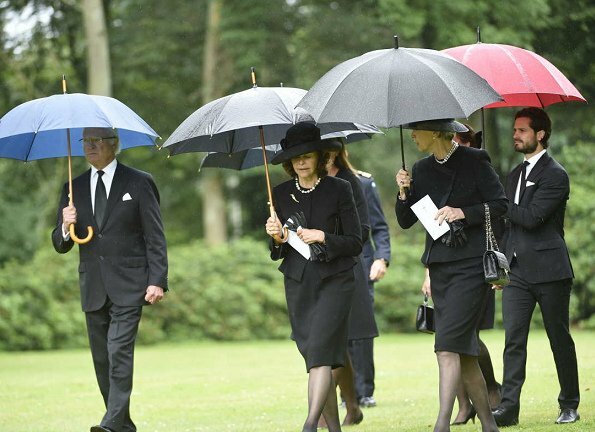 Then we remembered that there were heartwarming moments too at the funeral, e.g. when we called up different lovely moments or when we heard that lovely poem by Mary Elizabeth Frye, and it was somewhat comforting. Perhaps that is why I can not condemn when some royal is captured with a smile on her/his lips at this moments, and I hate when we are quick to talk down people we do not really know. I am not into the bows in Victoria and Sofia's hair. It looks very child-like. Not appropriate for women of their age. At least, it holds their hair off their faces. 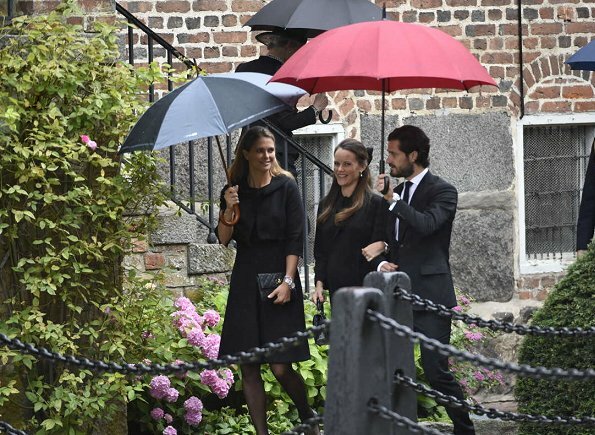 Interesting - Madeleine is walking with CP and Sofia and not with Victoria and Daniel ... And they had obviously much to say to each other. There is great sadness on Victoria's face. Its protocol. The king and queen, then victoria and Daniel, then CP Sofia and Madeleine, if Chris is not arround. 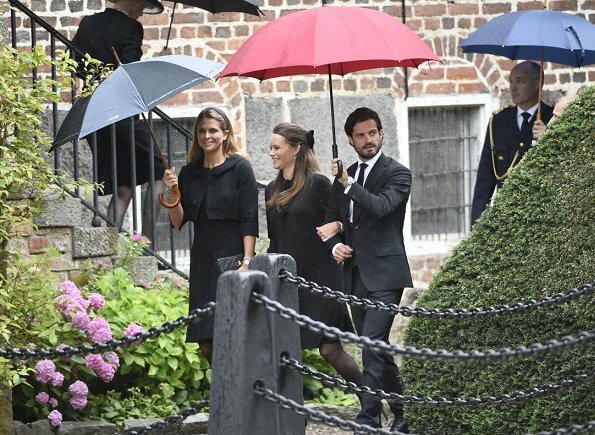 For Madeleine to go with victoria and Daniel in front of CP and his wife would be unusual. I dont know what they have so much to talk about - its a funeral.